According to cnbc.com, Amazon has gone aeronautic, and has been awarded a patent for “docking stations” to harbor drone-based deliveries. 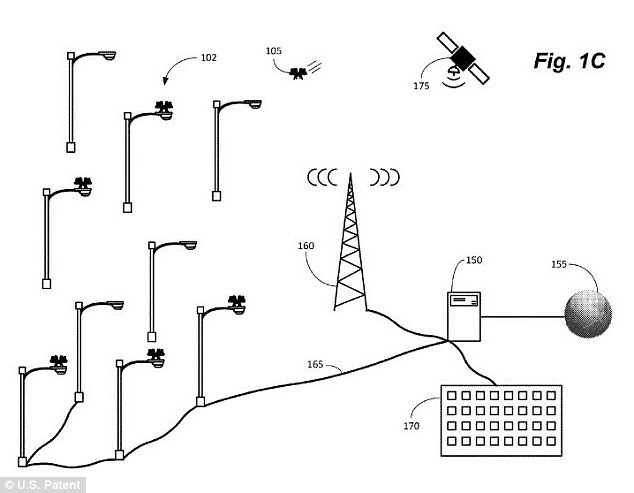 These stations would allow the drones to land atop streetlights or steeples for the purpose of package delivery. 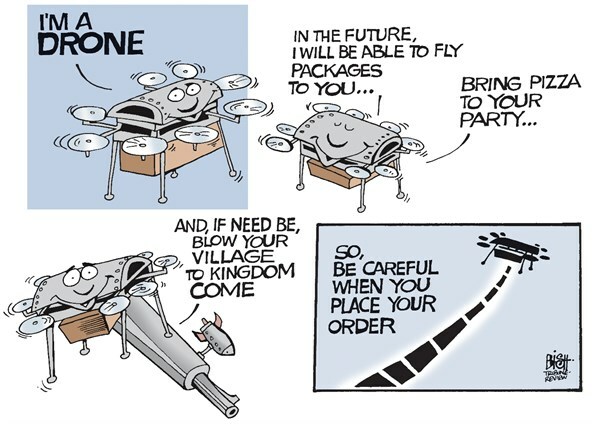 The drones could also recharge themselves autonomously during the course of a long-distance run, or while awaiting their next mission…er, delivery. "Grabbers" for packages...but also for intel? The stations could theoretically be so numerous that they would provide a significant map of sorts for the delivery drones to navigate by, and aid the drones in “talking” to one another for more expedient service. The stations could also provide a safe haven for the drones in case of sudden storms. Rooftops, cell towers, and electrical poles have also been considered for the drones’ homes. Packages would be delivered downwards via a “vacuum tube, dumbwaiter, elevator, or conveyor.” These sites, while seeming imminently prone to theft, would likely be held under strong surveillance. But hey, that means free or cheaper internet for the neighborhood, without any need for more cell towers! And probably no more pigeons. While this all sounds like a very cunning ploy from the surveillance state (DRONES EVERYWHERE! RECHARGE THEM AT WATCHTOWERS! ), we could see the benefit in not wanting to wait days for your package to show up via boring old regular mail. And it would be kind of cool to watch this new form of airmail swoop in with any arrivals. But how many drones will there be, and where? What else are they taking note of in their travels? The results remain to be seen. In the midtime, maybe they’ll just stick to slinging pizza? At least they're not delivering children...yet. Your camera is the only one source for capturing your memories but your camera cannot catch your speedy movement when you running on your vacation form one point to another point, however when you have the drone racing you can apply it easily with this. I think that you are right drone techonlogy could also be pretty useful for delivering things other than bombs, i ordered drone camera fro, amazon few years ago and it was damn awesome, thanks for the valuabe information and insights you have so provided here. A standout amongst the most interesting beginner quadcopter reviews highlights of the Parrot AR Drone is its cameras. Now that is awesome.Just imagine a package landing directly on your rooftop. I really like to visit your blog and I think drone technology is the most popular means of capturing information from air. Thank to share the advantage of professional drones. I will bookmark your blog and share this informative article with my friends. I really loved this post bro. But i want to tell you that I have published a a buying guide about best drone camera. If you have time can you please take a look on that. The main draw of this drone is the great FPV settings. The first-person-view syncs with either your smartphone or a VR headset, and you can watch the world from the drone cockpit after syncing. This FPV is easy to ease, and it's intuitive for smartphone users. Thanks for sharing the valuable information here, This is really a great enhancement in the modern technology that we can deliver the food packets with the help of drone. If you are looking for the best mini drone with camera, visit pevly.com. This is brilliant, I am impressed how Amazon enhanced their service as days passes to guarantee their costumer's satisfaction. It is cool to check out the drone deals for these prices at amazon. Thanks. I appreciate with your service, You are working good for everyone Please keep it up an do best from your side i m most impressed. amazon free gift card codes You completed some great factors there. I did a seek nearly the problem and determined re all folks will post when your blog. Outstandingly thought out! Can't wait to try it out. sharper image streaming drone I love your boldness! Drones have the power to help you make more of every adventure you take. Just flying a drone is an adventure in and of itself!